Happy Thanksgiving!! 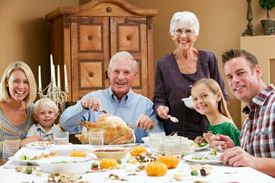 Some of you have already been active by participating in a Turkey Trot or Drumstick Dash, others may be enjoying some morning coffee while watching the Macy’s Thanksgiving Day Parade, or on the road traveling to see family, and those extra special individuals are busy cooking today’s feast. We all celebrate differently and have family traditions and things are thankful for. We are thankful for our amazing staff and the hard work they put in year round. We asked them to share what they are thankful for, what their favorite Thanksgiving dishes are, and about their family traditions. What are some of your favorite Thanksgiving traditions? Begin by offering new equipment orientations to small groups. The goal of the New Equipment Orientation phase is to provide a general overview of the new equipment to the small group by indicating where adjustments can be made, how to modify the amount of weight, safety features along with any other bells and whistles that apply. Offering an overview of the new machines with specifics on how to use them can be a great resource for members that are interested in trying out the machines independently after gaining preliminary information. The New Equipment Orientations could be paired nicely with an informational presentation where members have the opportunity to engage in a Q and A session. This is still the general information phase. Residents wanting individualized instruction can register for a one on one appointment in which the machines can be adjusted specifically for them. It is time to make the sessions personal by going one on one. Begin by taking a member around to each new piece of equipment and adjusting the setting and weight resistance correctly for that individual. Record the settings onto a program card that the member can then access each time he/she visits the Fitness Center. Keep in mind that you could be reviewing a lot of information at one time…and this could become overwhelming to the member. If this is the case then offer to meet with the member again in the near future to review the machines again. Between the follow up sessions to review the new equipment and the member having access to his/her program card to practice setting the new equipment independently, each member’s comfort level with the new equipment should significantly improve. Now comes the fun part: Add variety. As the member becomes more comfortable with the new equipment, now is the time to fuse the new pieces with the old. Create an Exercise Prescription Routine based on the member’s goals that include a variety of machines, bands, dumbbells, body weight exercises…having fun yet? Well your member’s should be! Follow up with the member every so often to ask about their exercise routine and be prepared to present a new and fun challenge. Now your members are familiar with the new equipment and can take ownership of their fitness routines. They can touch base with Health Fitness Specialists as needed and can move forward into the great services that your fitness center provides. Before you know it the renovations will be a thing of the past. Are you considering renovations in your Fitness Center or have you already been through this process? What worked for you? It is a time of change and excitement. Out with the old and in with the new. Things will be bright and shiny and…different. During the short or lengthy time that your fitness center is undergoing renovations, how do you gratify your members? Having a cutting edge corporate or active aging fitness center is what everyone strives for…but if you don’t have any members waiting for the renovations to be completed, then the doors will close before they can be reopened. Keep three things in mind during your fitness center renovations to ensure that your members are knocking on your fitness center’s door the minute they are reopened: 1. Keep members active 2. Keep members interested and 3. Use what you have. These may or may not be items that members have utilized before so seize this opportunity to demo the equipment and provide workouts with the item. These exercises can carry over with the member’s routine long after the renovations are completed. In addition to the smaller equipment, provide exercises using only body weight. …what else? There are tons! Create a workout with combinations of the body weight exercises. Try intervals or time based challenges. Some members might love to make it a relay in a group setting. Be creative. Market your Group Fitness Schedule. This is a great opportunity for members to expand their fitness regimen to include a group fitness class that has caught their interest. Body Pump, Boot Camp, Circuit, Body Stretch…whatever suites a member’s fancy. Add a bonus group fitness class(es) to the schedule. This will provide a nice option for members who are disappointed that their regular exercise routine was thrown off due to renovations. Implement a group fitness class that you’ve been wanting to test out. Whether the class is a staple in the schedule or a promotional session, seize this opportunity to promote your group fitness classes. Your plans for programming will most likely differ from the norm. Keep members interested by implementing an attendance based incentive program to encourage members to keep up with their activity routine then list several options. Keep your members informed by maintaining an open pathway of communication. Communicate to your members about what is happening in the Fitness Center. What are their fitness options in the meantime? Helpful tools: residential newsletters, in-house TV stations with daily event information, flyers in common areas, personal notices and phone calls can all be means used to successfully communicate. As long as it’s safe, the world is your playground. Target local features and landmarks to mix into the planning. Have you found other successful alternatives to exercise while the Fitness Center was undergoing renovations? Share your best solutions! Our staff is kicking off our annual Maintain Not Gain program at our client sites. This program is structured to help individuals maintain their weight through those months filled with tasty food and delicious treats that surround the holidays. As you gear up for the holiday parties and events stay on track by following our Free Workout Friday blog postings to keep your workouts on track. We aren’t saying you can’t enjoy the food, we just suggest proper portion sizes and that you don’t skip out on your workouts! If you aren’t a member at one of our client sites and would like help staying on track, “like” NIFS Fitness Management on Facebook and join our Facebook edition of Maintain Not Gain. Watch for the links to submit your initial weight November 16 – 22. Watch your newsfeed for tips to stay on track and submit your final weight in January. If you maintain and not gain through the holidays you will be eligible for a prize drawing! Now let’s get started with a great, easy workout to keep you on track! WARM UP with a 5 minute walk or anything to get your muscles warm! STRETCH, you never want to stretch a cold muscle, so always do so once the muscles are warm! Beginner: Repeat 3-5 times, with short or minimal breaks. Intermediate-Advanced: Complete as many times as possible in 25 minutes. We recently wrapped up our Build Vitality webinar series for 2013 with the fourth and final webinar titled, Build a Better Wellness Program. The focus was on four key areas - pillars, if you will - that cultivate a compelling living-well culture in retirement communities. Your wellness program should be evidence-based. That doesn't have to be as intimidating as it sounds. In fact, you probably already have some evidence-based programming built into your wellness offerings. They are fairly easy to find in physical dimension programming. Administering a senior fitness test? That's evidence-based. 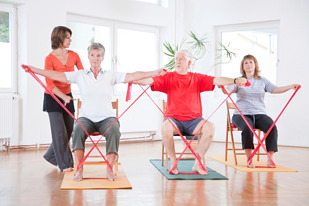 Providing balance training and fall-prevention support? That's evidence based. 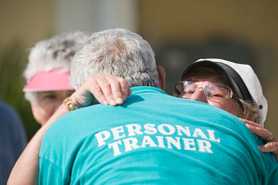 Your wellness program should be resident-specific. This really should go without saying, but I can't tell you how many times during my consulting work in senior living communities across the US, when I ask activity directors why they're doing a specific program, they cannot provide me with a sound answer. When your programming is focused on the residents, on the community, and on the Community (outside your four walls), you can cultivate meaningful, engaging, fulling opportunities for living. Your wellness program should be data-driven. How much do you spend on group fitness classes each year? Have you ever evaluated the impact of that money? If you host roughly eight classes per week, you're probably spending $10,000 per year on group fitness. When was the last time you dumped $10,000 on something without asking about the impact of that money? Get the data you need from your wellness programming so that you understand if/how it's working for your residents and for your business. Your wellness program should be story-worthy. What's the point if you can't capture resident stories of life well lived? This really is the capstone - if the other three pillars (evidence-based, resident-focused, data-driven) are all aligned, the stories will inevitably follow. Get creative in how you use the stories both to engage more current residents and to communicate to prospects how they can live well at your community. To get the details behind each pillar, watch the 30-minute webinar using the button below. To download all four webinars in our Build Vitality Series, go here. Thanksgiving is almost here! That means it’s time to sign up for your local Turkey Trot, Drumstick Dash or your own personal Thanksgiving Day 5K! Studies have proven that your metabolism increases for several hours post-workout, so make a priority to squeeze in some exercise and boost your body’s calorie burning abilities before the big feast. If you do happen to be training for a 5K on Thanksgiving Day, see below for a sample training program that starts on Monday, 11/11. So today, we want you to go for a brisk walk because you need to pick up the pace on Monday! Note: This an aggressive running plan, as Thanksgiving is quickly approaching. It is highly recommended that you have done some running prior to starting this program, and that you are comfortable running 1+ miles. If you are a beginner runner, make a goal of finishing the 5K through a combination of walking and running. You can easily just walk through this schedule to help prepare for your event of choice. 11/28: Race day! Run 3.1 miles! On days in between runs, focus on cross-training, for example weight-lifting or non-impact cardio (elliptical, biking, swimming, etc.) Allow for 1-2 days of rest each week. Check out past Free Workout Friday videos for cross training options. Happy turkey trotting and drumstick dashing! Ashley Shirley, one of our corporate fitness members out of Ohio, shares her story and the benefits of utilizing the NIFS Fitness Management staff at her onsite corporate wellness center. 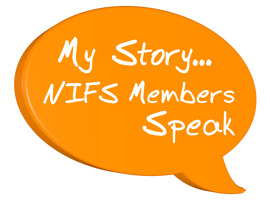 After having two kids she relies on the NIFS staff for accountability and to keep her going! "Eating healthy and being fit was a way of life for me before having 2 kids. It was just something I wanted to do for myself. 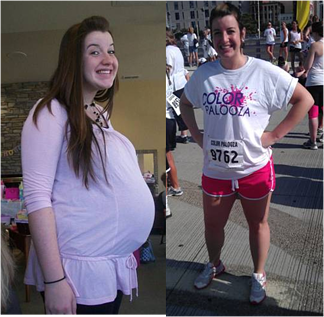 When I got pregnant with my first child I gained 75 lbs, so I went from 155 to 230 in a 9 month period. It was extremely hard on my body. After my second child I was pretty much right back to where I was after my first one. I was miserable because I knew that it wasn’t the way my body was made to be. It’s hard to work out when you have two little ones at home, so having the wellness center here at work is an extreme blessing for me. I take advantage of it every day on my lunch hour. I love the fact that we have an option to take classes if we choose to and I also take advantage of Monday boot camp and will be starting Wednesday TRX classes. Another reason I keep coming back is because I have accountability through Adrienne. She is awesome! She gives us the workout of our lives every time we walk in the wellness center. Even if I’m not taking a class with her she is always there for encouragement and to help me become the best I can be by educating me. She pushes me personally to be better than I knew I could be, and she stretches me way past my comfort zone! For her position, that’s a compliment! There isn’t a class I take that I don’t wake up the next day feeling it. She is all around a sweet person and really makes it a comfortable atmosphere to workout in. Since my last child was born last October I have lost close to 60 lbs! She has been there every step of the way cheering me on! I’m not the only one who feels this way either, we sure do love her!" *Weight loss claims or individual results vary and are not guaranteed.